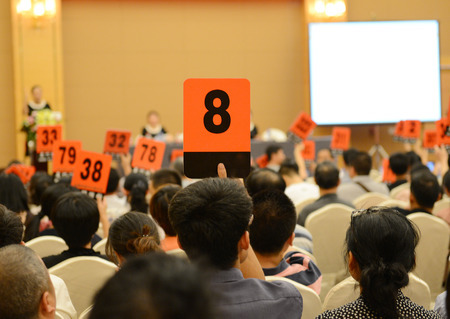 A Few Expert Auction Bidding Tips | Wilson Auction & Realty Co, Ltd.
Bidding on items at an auction can be an exhilarating experience. If you’re able to win an auction and get a great deal on an item, you’ll feel a huge burst of adrenaline shoot through your body. However, making bids at an auction can also be frustrating if other people are constantly outbidding you. It’s why you should make sure you’re prepared for an auction before attending one. Check out a few auction bidding tips below. Try to find out what will be auctioned off before attending an auction. It can sometimes be fun to show up at an auction and blindly bid on items. However, generally speaking, you should try to find out what’s going to be auctioned off at an auction before you show up for it. This will give you a chance to develop a winning strategy. You may want to avoid placing bids on certain items so that you can concentrate all your energy on bidding on others. Do your homework and see if you can find out what you’ll be able to bid on prior to an auction. Create a budget for an auction ahead of time. How much are you willing to spend at an auction? That’s a question you should ask yourself ahead of time, and you should be firm about not going over your budget. It’s very easy to get caught up in the heat of the moment during an auction and spend more money than you planned. It’s important to stay disciplined and stick to whatever budget you put in place at the start. Get ready to deal with squatters and snipers during auctions. Whether you’re attending an auction in person or taking part in an auction online, it’s a good idea to mentally prepare for dealing with auction squatters and snipers. Auction squatters will go out of their way to place bids early and often to try and scare other bidders off. They’re aggressive and will do whatever they can to intimidate those in attendance at an auction. Auction snipers, meanwhile, hide out in the weeds during auctions before pouncing once there are only a few minutes left. They’ll drive the price of items up and do their best to steal a win at an auction at the last second. Be aware of the fact that you’re likely going to come across both these types of people at auctions! If you’re interested in attending an auction, Wilson Auction & Realty Co. would love to have you. We hold auctions for real estate, intellectual property, heavy equipment, and so much more. Call us at 419-636-5500 today to learn more about our auction services.